WIN a copy of Until Tuesday - an inspirational tale of one man and his incredible canine companion. Until Tuesday is the powerful and moving story of how Tuesday, a service dog, helped to heal a shattered soldier. 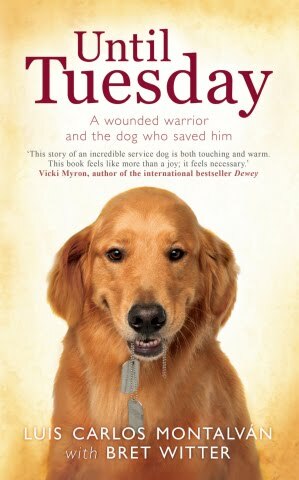 This touching book entwines Luis Carlos Montalván’s story of courage with that of his trusted Golden Retriever, Tuesday, and shows how a brave soldier found a way back from the devastation of being injured in action with the help of his canine friend. What kind of dog is Tuesday? The closing date is 6th June 2011 and ten winners will be randomly selected from the valid entries received before the closing date. The prize is one copy of Until Tuesday in hardback. This prize is non transferable and cannot be exchanged for cash. In the event of being unable to contact winners within 7 days of the prize draw, the promoter reserves the right to reallocate the prize to the next randomly drawn correct and valid entry. The competition is open to UK & ROI residents excluding employees of Headline Publishing and associated companies or Dogs Trust or anyone connected with the promotion. The information you provide will not be shared with other companies by the Promoters. The Promoters will only use your address in compliance with the provisions of the Data Protection Act 1998.